Yachts are likely to deteriorate quite easily, because they sit on sea water, which can corrode the metals inside. Yachts are exposed to wind, rain, humidity, extreme sunshine and extreme cold, and they are continuously battered by the sea when they are running. If not taken care of properly, a boat can become completely useless very quickly. Motor yacht engines and drives need particular maintenance. The lubricant oils used marine engines need to be changed after a certain amount of usage, normally every 100 hours, and at least once a year if the engines are not being used much. Your engine manual will tell you how often to change the oil for your particular engines. Oil used to lubricate the gearbox, hydraulic trims, and steering mechanisms also need to be changed together with the engine oil. 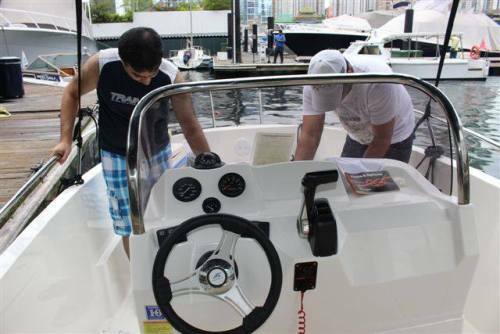 It is always recommended that boat owners choose professional service agents to maintain their engines, especially if the engines are under warranty. If the owner uses unauthorized service agents, the real service agents are within their rights to deny warranty repairs. If your warranty has expired and the authorized agent is very expensive, the owner should try to find a reputable company or engineer to maintain his or her engines. Most yacht hulls are currently made of fiberglass. Fiberglass usually needs very little maintenance if built correctly. The most common maintenance that the hull needs is for the gelcoat, a shiny outer layer on the fiberglass. This layer requires frequent washing with special fiberglass detergents. Many people just use common soaps to wash the fiberglass, which will not keep a long-lasting shine. Polishing or waxing your hull every six months is also important. As for the part of the hull that is underwater, this needs to be cleaned every 6 months to get rid of marine growth and debris accumulated on the hull, propellers and shaft. This can be done by lifting up the yacht, cleaning it with a high-pressure water jet hose and painting it with a special antifouling paint. After a couple of years it is recommended that you scrape off all the old layers of paint on the hull and paint it with antifouling paint again. If you simply keep adding layers on top of layers, it will eventually become too thick and will start to come off completely, exposing the fiberglass to the marine growth and potentially damaging the bottom of the hull. Most of the interiors and fittings on a yacht can be easily repaired in a similar way to how you would repair the items in your home. Almost all countries have local shops that can replace any items that are worn out on your yacht. However, it’s always a good idea, if you are buying a new yacht, to ask the factory to give you spare wardrobe handles and electrical switches, or you might have trouble finding fittings that match your old ones when you need to replace some of them. The same goes for wooden paneling. Sometimes it’s very difficult to find an exact match if the wood paneling if your interiors have been water damaged. This is why it’s best to take precautions. Sometimes the only way to replace the wood is to order an entire new panel from the factory, which in many cases is also a difficult endeavor. Factories keep changing their wood styles and designs, so it could be very difficult to find an exact match if a lot of time has passed. It can also be rather expensive to replace the whole wood panel once your warranty has expired. The best way to prevent this entirely is to always check the window and door seals. The main factors that damage your interior wood over time are direct sunlight and water damage due to window leakages. Always check that you don’t leave any windows open during rain. Sometimes there is moisture in the air conditioning duct, and sometimes water can accumulate below a fridge or an icemaker in the interior. To prevent this, it is important to always check for water accumulation under fridges or ice makers. It’s also a good idea to have extra icemakers and fridges on the outside deck on the fiberglass where it’s not touching any wood. For protection from the sun, it’s a good idea to install protective ultra violet film on your cockpit doors and windows. Some UV protection films are completely transparent and do not tint the windows, letting natural light in, yet still blocking out the majority of UV rays that damage the wooden interiors. Many classic-style polished cherry wood fades in color or becomes milky when exposed to direct sunlight for long periods of time. It is also recommended to cover your boat with a tailor-made canvas designed to fit your boat perfectly so as not to allow any flat surfaces for water to accumulate in. Covers also protect your boat from exposure to the elements, and bird droppings. You should also always make sure that your bilge pumps are working, and your batteries are charged, when you are leaving your boat for the weekend. Overall owning and using a yacht, if it is a power boat or a sailing yacht is not as difficult and expensive as many people think. It is not just a healthy hobby but a chance to experience our vast oceans and part of the world that still remains unknown to the busy city dwellers. Working hard in enclosed offices has become a norm for many of us and although we can earn ourselves a comfortable life we barely get a chance to go on an adventure by ourselves. Yachting brings that adventure in our lives. The sheer madness of the sea is one of the most refreshing things that can pull us away from our daily stresses and bring our mind back to a beautiful equilibrium.